Based in Redhill, Surrey, Homewood Heating are your local plumbers for whatever plumbing jobs you need doing. Our plumbers are Gas Safe registered and experts in their field, happy to take on plumbing jobs of all sizes, from fixing a leaky tap to fitting a new bathroom or shower - and because we are your local plumbers, we can get to you quickly in the event of an emergency. If it's plumbing, we can do it! So call us now for a free estimate or to discuss what you want done. Homewood Heating are expert central heating engineers, specialising in the installation of gas and LPG central heating systems and boilers, and the servicing and repair of existing systems. With over 20 years experience, we can help you decide which system is right for you, whether you are looking to extend an existing installation, replace an old boiler with an energy-efficient alternative, or install a new system completely. Our engineers are Gas Safe registered and registered Vaillant installers, so we can give you a 7 year guarantee on selected Vaillant boilers. Our advice is free and so are our estimates so call us to discuss your requirements. 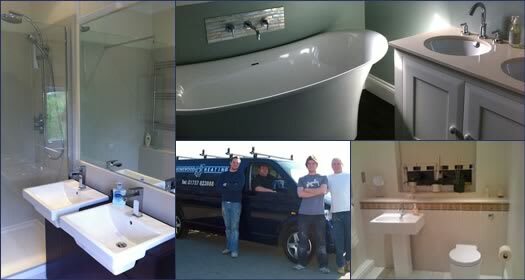 Our qualified plumbers can make your dream bathroom a reality and deliver a finished project on schedule and in budget. 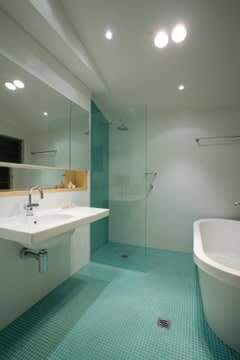 We have installed hundreds of bathrooms, showers and wet rooms, so if you are thinking about the possibilities, give us a call and benefit from our experience. We can help you choose the best fittings for your space, and advise on lighting and ventilation as well as the routing of pipework. Established since 1989, we have grown the business by providing an attentive service to our customers. Much of our work is repeat business from existing customers. Once they have used us, they don't want anyone else! We don't cut corners - we take the time to do the job right, and we only use good quality materials and fittings that will last. Our plumbers take pride in the work they do and in providing all our customers with courteous and efficient service carried out to the highest quality standards. As well as domestic plumbing, we also handle light commercial work such as shops, offices and care homes. Our plumbers are Gas Safe registered for natural gas and LPG appliances. Homewood Heating is based in South Nutfield in Redhill, Surrey. We cover Surrey and West Sussex including Bletchingley, Godstone, Tandridge, Oxted, Blindley Heath, Lingfield, Newchapel, Outwood, Smallfield, Horne, Felcourt, Felbridge, East Grinstead, Rowfant, Copthorne, Shipley Bridge, Burstow, Pound Hill, Worth, Maidenbower, Crawley, Ifield, Lowfield Heath, Charlwood, Hookwood, Horley, Norwood Hill, Leigh, Sidlow, Salfords, Reigate, Brockham, Betchworth, Walton on the Hill, Tadworth, Kingswood, Chipstead, Hooley, Chaldon, Coulsdon, Kenley, Whyteleafe, Warlingham, Caterham and Woldingham. We may undertake work further afield if the job is substantial enough to make the travel worthwhile. We are happy to accept most major credit and debit cards: Mastercard, Visa, Solo and Maestro. We take pride in our work, so you can be proud of the result! Plumbers and Central Heating Engineers covering Surrey and West Sussex, including Bletchingley, Godstone, Tandridge, Oxted, Blindley Heath, Lingfield, Newchapel, Outwood, Smallfield, Horne, Felcourt, Felbridge, East Grinstead, Rowfant, Copthorne, Shipley Bridge, Burstow, Pound Hill, Worth, Maidenbower, Crawley, Ifield, Lowfield Heath, Charlwood, Hookwood, Horley, Norwood Hill, Leigh, Sidlow, Salfords, Reigate, Brockham, Betchworth, Walton on the Hill, Tadworth, Kingswood, Chipstead, Hooley, Chaldon, Coulsdon, Kenley, Whyteleafe, Warlingham, Caterham and Woldingham.